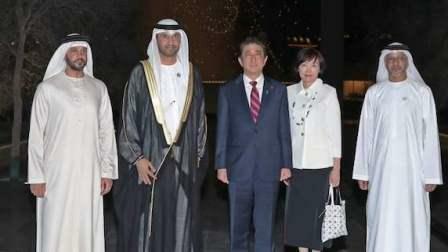 Japan's Prime Minister Shinzo Abe, accompanied by Dr Sultan bin Ahmad Sultan Al Jaber, Minister of State; UAE Ambassador to Japan, Khaled Amran Al Ameri, and Ambassador of Japan to the UAE, Kanji Fujiki, visited on Sunday the Founder's Memorial in Abu Dhabi as part of his visit to the country. Dr Yousef Al Obaidli, Director General of The Founder's Memorial accompanied the Japanese Prime Minister and his accompanying delegation in a tour. During the tour, they were briefed about the outstanding legacy of the late Sheikh Zayed, which was clearly manifested through the artwork " Al Thuraya", and the " Heritage Park", rare recordings of the late Sheikh Zayed, as well as video footage that narrates his noble values ? ?and his inspiring legacy. The Japanese Prime Minister also watched "Al Thuraya", the three-dimensional artwork that characterises Sheikh Zayed, whose engineering forms shine in the evening in a way that simulates the stars of the sky. It is deemed one of the unique artwork. He also learned about Sheikh Zayed's love and his deep commitment to the preservation of the environment in the "Heritage Park" which includes various types of flora and fauna that are part of the rich natural environment in the UAE and the Arabian Peninsula. At the end of the tour, Abe toured the 'Walkway', a path which is punctuated with visionary quotes by Sheikh Zayed, offering a space for quiet contemplation of his wisdom.